Click Here for all my posts on recipes that I have done! Bathroom Cleaning with Thieves Cleaner!!! Pour approximately ¼ cup of baking soda and 2 drops of Thieves essential oil blend directly into the toilet bowl. 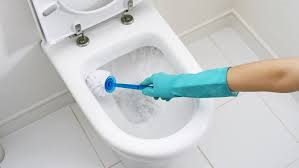 Stir with a toilet brush and let sit for a couple of minutes before cleaning. Spray and clean around the toilet seat and rim with the basic cleaner. Thoroughly clean the toilet inside and out, especially around the outside bowl. Use Thieves Spray to clean the toilet knob. When replacing toilet paper, dab 3-5 drops of Thieves essential oil blend on the inside of the cardboard roll (not on the paper). 1. Window cleaner: Mix 1 capful of Thieves Household Cleaner with 4-5 cups of water (add 2-3 drops of Lemon essential oil for a fresh lemon scent and/or 1 tsp of white vinegar for streak-free clean). Clean windows, sills and mirrors to remove dirt, sticky residue and grime. 2. 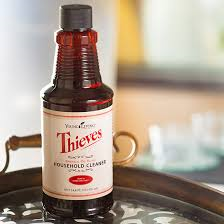 Dishwasher Cleaner: Add 1 capful of Thieves Household Cleaner to the bottom of the dishwasher to clean dishes. 3. Stain Remover: Got a tough stain on your clothes? Use Thieves Household Cleaner without dilution on the stain. Scrub gently with a small brush until the stain is gone. 4. All Purpose Cleaner: mix 1 capful Thieves Household Cleaner with 2-3 cups of water. Spray on any surface and wipe away. Replaces cleaning sprays. 5. Glass and Mirror Cleaner: In a glass spray bottle, mix 1 capful Thieves Household Cleaner, 5 drops Lemon EO, 1 tsp white vinegar, with 3 cups of water. Spray glass and mirrors and wipe away. Replaces glass cleaners. 6. Deep Clean Scrubbing Solution: Mix Thieves Household Cleaner with Baking Soda to form a thick paste. Use this paste to scrub sinks and tubs. Replaces cleansers. Recycle an old dish soap container and mix all ingredients together! Fill baby food jar with coconut oil. Add 20 drops of therapeutic grade lavender essential oil. Mix well. Keep on hands for cuts, scrapes, diaper area, etc! Add oil to the vodka and shake well against the palm of your hand for 20 shakes. Add purified water and shake again. Spray directly into the mouth 1-2 times to freshen breath. No more dragon breath! Amazing Special-17 Bottles of Oils and 2 Diffusers!!!! Freebies, Discounts and more on the Premium Starter Kit!